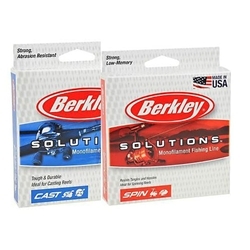 The Berkley Solutions Monofilament lines are targeted for anglers who want to take the guesswork out of choosing line for their reel and spend more time fishing. The Berkley Solutions Line is tough,durable,strong, and abrasion resistant. Comes in two different series; Cast & Spin. The Cast Series is specifically designed for low-profile or round baitcasting reels. Strong, trouble free, easy to use, stacks and handles well on baitcast reels. While the Spin Series is designed for open face or closed face spinning reels. Resists tangles and hassles.